The cannabis plant’s sugar, fiery hair round nugs covered with little leaves are all part of the complex anatomy of the plant. Whether you’re a grower or just a fellow curious about the marijuana plant, one of the seminal things you have to know is the part of the plant and what does is its purpose to the whole. 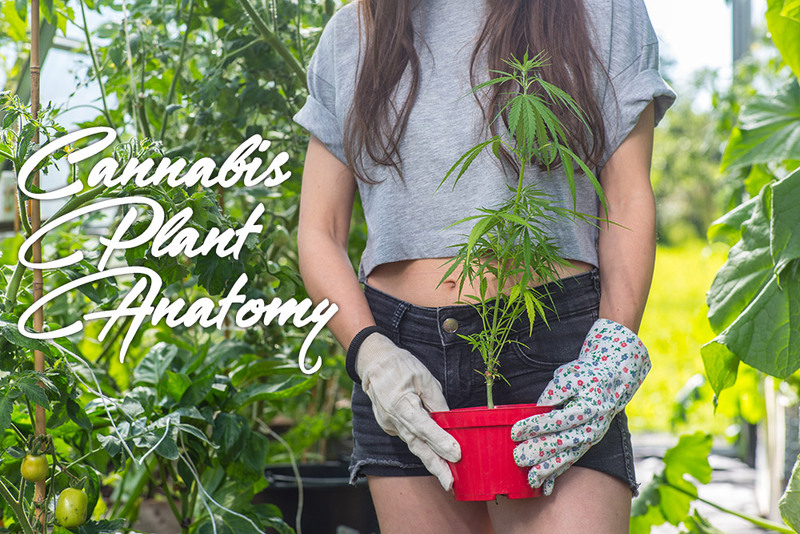 Starting off with the basics, just like humans there are both male and female cannabis plants and some is hermaphrodite. In botany, it is a conventional wisdom that the male plants are of little use, which is a fact in the cannabis plants. The male plants produce far lesser cannabinoids than the female ones, including the THC, which is a crucial component of the plant as it the one that produces the psychoactive as well as therapeutic effects. The male plants aren’t completely useless, because a good strain of male plants could play a major role in breeding. And most especially, germination would be impossible without the pollen of the male. To ensure that good genes are passed off to the offspring, the grower should identify and select the right male plants. The offspring will mostly inherit many important traits, including overall health, resistance to pests and molds, and a good growth rate. In auto-flowering strains, the males can be useful when breeding because they significantly influence the offspring’s growth, allowing the flowers to preserve the potency and flavor of the mother-bud. What’s more? It is that they’re also good in making raw juice, though not as good as the female. They provide an exceptional source of hemp fiber. Lastly, they can be used as a natural pest repellent. Cannabis consumers are reasonably familiar with the two parts of the plant: The buds and the fan leaves. But sometimes the rest of the plant is not known which is important whether you’re planning to cultivate or just simply be a consumer. The different morphologies and structures of the indica and sativa plants are important to take note. Indicas are short and stocky while the sativas are tall and thin. From the efficacy prospect, the sativa strain is better in treating depression and PTSD, while the indicas are for arthritis, during cancer treatments (used to restore appetite of patients that undergoes chemotherapy) and pain relievers. The former delivers that energetic, cerebral high while the latter is more of sedating and appetite stimulating. In the cannabis anatomy, most of the time the resin-bearing female is the focus. The female plants produce medicine and commercial recreational herb. Male plants are used only by growers to pollinate females to find new and unique strains. Some growers just work from clone taken from female mothers. Also known as the apical bud, the cola is found at the top of the plant and typically the largest accumulation of flowering buds on the plant. Small plants also produce multiple colas at the end of their main branches. The cola is also termed as the terminal bud as it does not develop at the mid-section of the main stalk and branches of the plant. Gardeners use a variety of techniques that could increase the number of colas on the female flowering cannabis plant and produce exceptional yield. The pistil is the “hairs” that rises from the inside of each calyx. At first, they will appear as color white but eventually, they’ll morph into orange, red and then brown. A fundamental knowledge of the pistil is that it is the female reproductive organ of any plants. They may sometimes curl and bend as they function to capture pollen from the male, carried by the pollinators like insects. Even though bright orange pistils are associated with better quality plants, it actually means very few trichomes, which offers the plant with no aroma (caused by the terpenes) or even potency (by the THC content). This is the most important part of the cannabis plant, this nearly microscopic, translucent resin glands that coat the flowers and sometimes fan leaves, are called trichomes. They contain the “miracle molecules” known as cannabinoids and terpenes found in the cannabis plant. With a synergy effect, the cannabinoids and terpenes found in the trichomes operate together to produce medical efficacy or euphoric effects of the plant. Trichomes and the rich resin they produce are used to create a variety of cannabis extractions and concentrate which includes kief or loose powder trichomes, hash or old-school pressed trichomes or ice water extraction via “bubble bags”, BHO (Butane Hash Oil), and modern interpretations on the theme like wax, shatter, and glass used in dabbing. Although most of the focus of both medical and recreational users is on the flowers of the plant which produces euphoric effects, doctors and researchers are increasingly investigating and documenting the medicinal properties of juicing fan leaves, though this part may not induce the psychoactive effect, but it does provide an abundant amount of THC-A, the acidic forerunner of the THC used for fighting disease and provide treatments. The only unsuccessful feature of juicing is that it involves consistency of the regimen which requires more than 20 large fan leaves per day. Nevertheless, research is being conducted, and the use of this information will be of great use in the near future.